Namibia is a vast country and offers an abundance of destinations. It also offers various options as to reaching those destinations. Namibia is very popular among self driving visitors as the road network is fairly good and the amount of scenery along the roads can be quite extraordinary. Another great option is a fly-in safari. This allows you to save some time when moving between destinations as they can be quite some distance apart. Scenic views from the skies are also incredible. A third option would be to opt for a guided safari or a packaged trip with a local guide. The landscapes of Namibia have incredible tales to tell and local expertise and knowledge can be very rewarding in uncovering those stories. Although not a recommended option, there are a few shuttle services in between destinations, but do take note that Namibia is an African country and hitch hiking is not a very safe option. 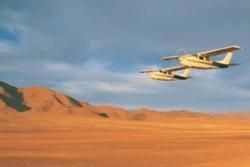 Various charter companies offer the opportunity to discover Namibia from the air. A flying trip provides more time to experience each destination and also removes the responsibility and stress of having to drive long distances in a foreign country. It offers a more relaxing trip and adds that extra special touch of luxury. Do take note however that most of the aircraft used are quite small and due to the distances flying can be expensive. Namibia is a vast country and flying might diminish the opportunity of truly experiencing the character of the country. Luggage with most companies is limited to 20kg per person packed in soft bags with no plastic or hard covers. Although some sites in Namibia can only be viewed from the air on a scenic flight, do not miss the opportunity of indulging into the fullness of this magnificent country. Rental companies in Namibia offer everything from a small sedan vehicle to fully equipped 4x4 camping vehicles with rooftop tents. For Namibia a 2x4 at least is recommendable due to some of the roads to popular destinations being uneven and corrugated. Main tarred roads in between destinations and towns are in good condition, but some of the gravel and country roads can be quite bad. Driving by road opens up the vastness of the country and one realizes that the horizons seem unreachable. Fuel is obtainable at most towns, only the remote areas require an extra canteen. Driving allows you to experience Namibia at your leisure and is also a cheaper option. Namibia has a lot to offer and for a driving safari, at least 14 days are recommended to fully appreciate its wide open spaces and gems. Public transport or shuttle services in between destinations and towns are generally not advisable. Most shuttles to and from major towns run daily or less frequent in more remote areas but it is difficult for accurate tour planning. 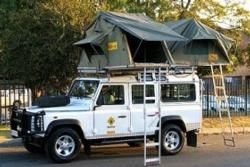 Hiking is definitely not advised and vehicle hire will be a safer, cheaper and much more rewarding option to opt for.